I have almost exclusively fly fished while living in Montana, aside from the first couple years I lived here and some random fishing in the deep waters of Lake Erie or the Sea of Cortez once or twice. I grew up spin fishing but made the switch to fly fishing when I was younger because it seemed like the Montana thing to do. 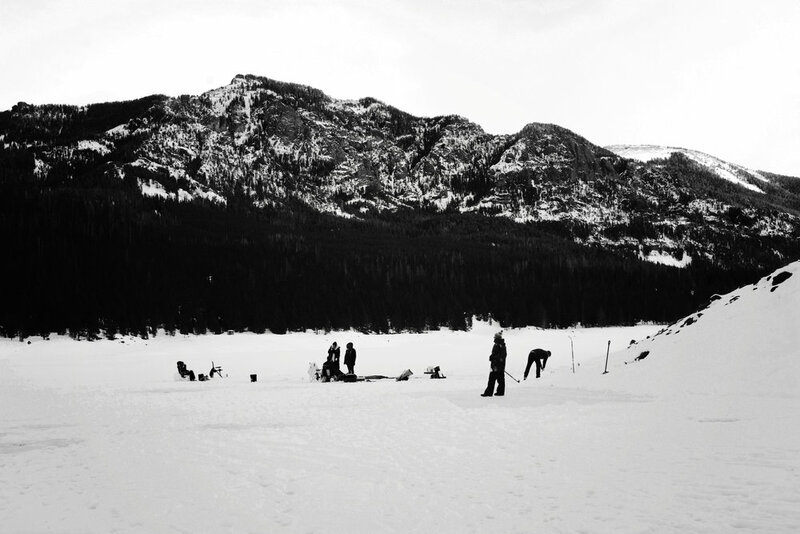 The other day my good friends Benn, Marie and some other pals decided to go ice fishing. 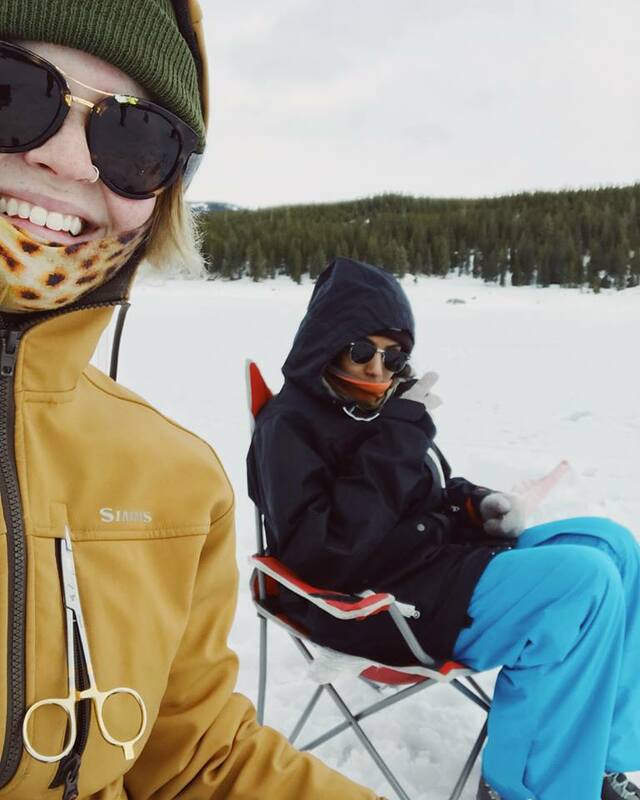 For the novelty of ice fishing and spending time outside with friends, I decided to go. 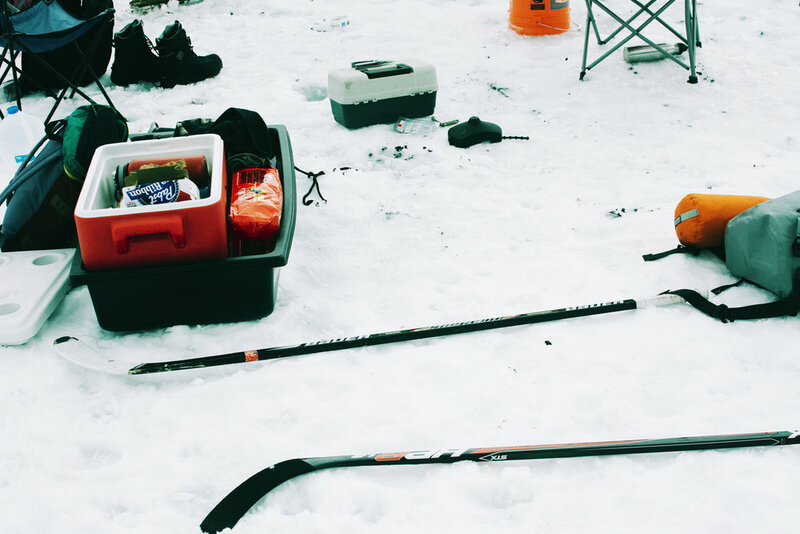 We headed out to Hyalite with our tiny rods, hockey sticks, beers, and worms. I was jokingly asked a few times if I needed to be shown how to rig a worm onto a hook, or if I was going to be ok if we kept fish to eat. My first cast (drop? uh, first time putting my line in the water) I hooked into a nice fish. 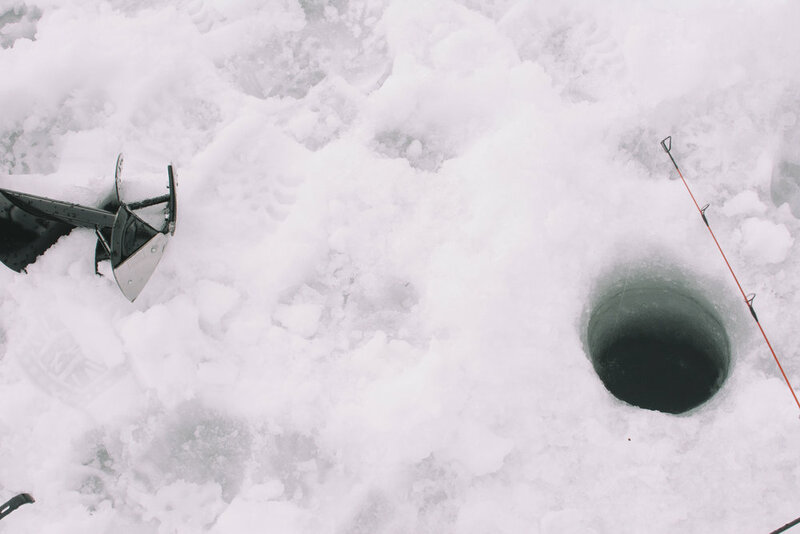 Pulling the fish up from the void under the ice was a humorous action, we both were cold and moving slowly, but none the less excited to see each other. 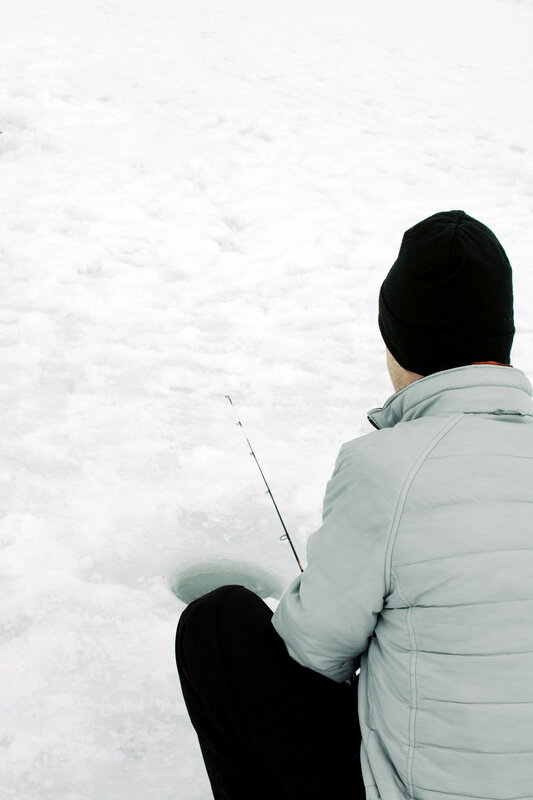 As we waited for fish to bite, we shoveled off a patch of ice away from the holes to play some hockey on. 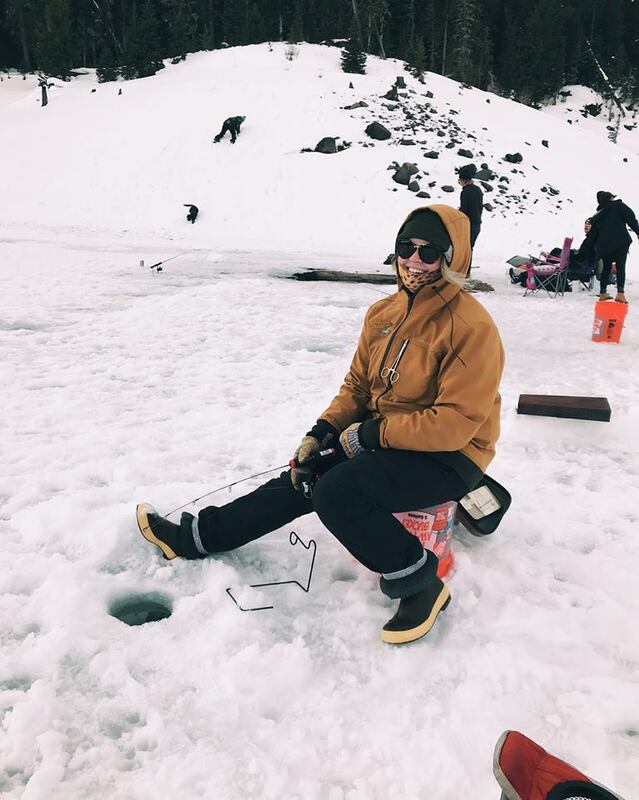 A little stick and puck in different varieties (man v man, men v men, and man v canine) filled parts of the day in between bobbing rods and pulling trout through the ice. 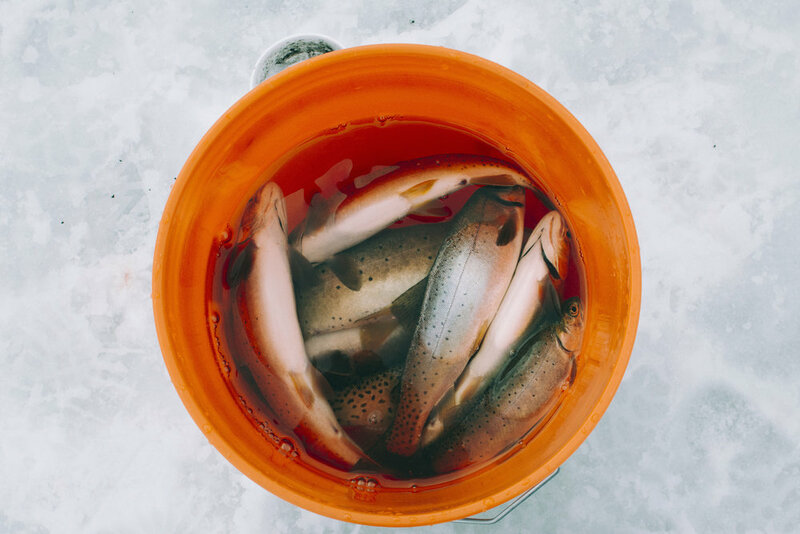 After a few hours on the ice, we headed home with a bucket of fish. A little while later, I was seated at the table with a beautifully cooked trout in front of me and a table of friends around me. It's been years since I kept a trout, let alone ate one. 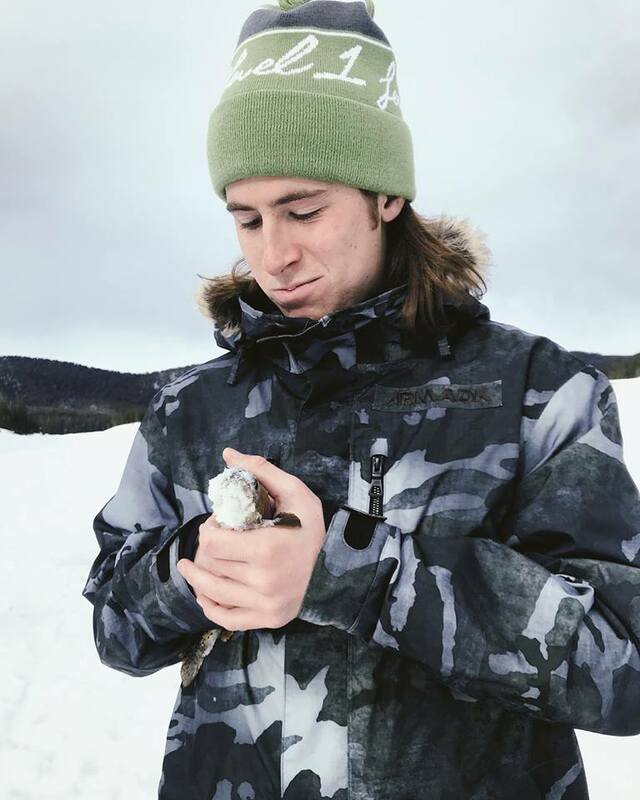 After hunting this year and spending time reflecting more on where my food comes from, it was easier for me to eat the trout. We caught it from an area where the population can support us keeping some and it saved us a trip to store to buy farm raised fish. The fish was delicious, the fact that it came from ice cold water, was kept cold and prepared quickly helped keep everything fresh. When it comes down to it, these trips and experiences aren't about quantity or competition, they are about the people around you and quality of time and experience. If you are in good company, practicing good sportsmanship and enjoying the time you have, then you're doing something right. Click here to read about fishing for King Salmon and making new friends in NY.